Italy is now the third foreign country I have driven in! The plan for my trip to Italy was to see friends near Rome and then go to Venice. I knew there were towns along the way I wanted to see and getting to my friend’s house seemed easier by car. After talking to lots of people, I was assured that driving in Italy would be easy compared to driving in Qatar. This also made it possible for me to make several stops along the way to Venice. This post may contain affiliate links. If you click on the link and make a purchase, I may earn a commission at no additional cost to you. 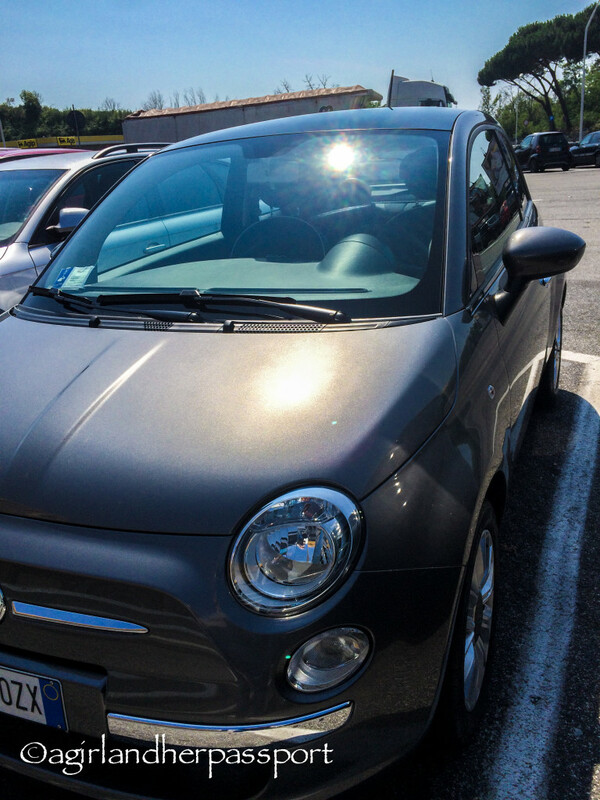 Once I decided to rent a car, I was faced with how to rent a car in Italy. Most major US car rental companies have branches in Italy, but they weren’t always the cheapest option. After I had booked my hotel in Venice using Hotels.com*, I saw that they also did car rental brokering. Essentially, you tell them what you need and they negotiate a price for you. It is all done instantaneously and then you receive a confirmation email with a voucher to present to the car rental agency. Renting the car through Hotels.com was the cheapest option I found. The other issue was that I don’t know how to drive a manual transmission and the Italians love a manual! Most of the rental cars were manuals and finding the automatic transmission section was hard. Originally, I thought I would drive from Venice to Rome and Venice didn’t have many automatic options. Rome had many more. The Hotels.com car rental process for finding an automatic was easier than the European car rental company sites. You should also be aware that the automatic transmissions were also more expensive than the manuals. Knowing that towns are old and parking could be an issue, I opted for the smallest car they offered. It ended up being the Fiat 500 you see above. This was a real benefit when I had to maneuver through the tiny parking garage at my hotel in Verona. It was also good when parking the car in my friends’ small village. Small cars are very common for these reasons and there seemed to be plenty of them in the rental car garage. The actual driving! Here are my tips for driving in Italy both on the highway and in the country. This includes guides to the driving rules. Italians drive fast! If you don’t want to drive fast, stay out of the far left-hand lane. If driving fast makes you nervous, drive in the far right-hand lane. People cut in and out of lanes quickly and closely. Don’t worry about it as this is common and the Italians know what they are doing. A few Italians flashed their lights at me telling me they were coming and to get out of their way. Get over if you can, but if you can’t just use your signal to indicate that you will get over when able. Tolls! All the highways have tolls and they are expensive. I spent almost €40 on tolls. Some toll booths are automated and some have a person. Be sure you go in the lane that is marked for cash and not the Telepass, which is like a toll tag. A few seemed to take credit cards as well. Gas is expensive too. I spent over €100 on gas for a week’s worth of driving. I did pay for the serviced option because I wasn’t sure which gas to put in the car and I didn’t need to screw that up! There were plenty of service stations all along my routes, even in the villages. The ones in the villages might be self-service at some times of the day and you will have to pay in cash. Turn your lights even during the day in the country. This is the law. Going fast in a small car isn’t as scary especially when everyone else is in a small car. However, my car took its time getting up to speed on the highway. The usual speed limit on the highway is 130 KPH, which is about 81 MPH and everyone was speeding! Speed cameras are everywhere. The GPS I rented warned me of them, but the ones in the small towns were not always detected. I have been back for less than a week, so I have no idea if I got any tickets yet! Google “speed camera Italy” to see what they look like. Some were very obvious and some were not. Get a GPS. Get it from the rental car company as it will be the most up-to-date with maps and speed cameras. It was more accurate than my Google maps app on my phone. *This post was not sponsored by Hotels.com. A Visit to Monster Park! Great tips for driving in Italy. I’ve jever driven in a foreign country. It’s funny how many differences there are in each country. I don’t get why your lights have to be in during the day though! Thanks! I am not sure why either. I will have to ask my friends that live there if they know why. Thanks for the helpful tips! I hope to move to Italy next year. We are living in Japan right now and everybody is soooo slow at driving. I am jealous you get to move to Italy! Do you know where you will be living? This post cracked me up. Really. You don’t know how to drive a manual transmission? In Italy – I think in Europe, actually – you can’t even get a driving license if you don’t drive a manual transmission. I am used to driving in Italy. It is where I grew up and I have learned to drive here. I actually get bored driving in places that are not as challenging. Hahahaha. But yes, for someone who is not used to it, it can be scary and gas is EXPENSIVE here! Nope. Many Americans don’t know how. We aren’t required to learn. The driving didn’t scare me, but I could see how it would scare some people. Glad you enjoyed the post! I’m always so hesitant to drive any car that’s not my own, especially in a foreign country. I think I would have been far too scared to give it a try in Italy! It did take a little bit to get used to it but it was worth it! So glad you drove and glad you enjoyed it. I never had any trouble driving in Italy except perhaps Rome with all the one-way and closed streets. That was before GPS and yes, I drove stick without being an expert at it. Fuel is very expensive and so are the tolls, but the freedom of setting your own schedule and venturing off the main path is so worth it. In most of the big cities you can park your car on the outskirts and then take public transport into the center. GPS would make everything so much easier. If you think Italians drive fast, wait until you drive in Germany. The GPS was really accurate and that was very helpful. I had no issues with parking but really only needed that in Verona. I really will never understand why Americans don’t have to sit their driving test driving ‘stick’ or ‘manual’ – it’s the standard in so many other countries and a really good skill to have. Well done for adapting so quickly to it though! I bloody hate driving in cities in other countries! Most Americans never leave the country unfortunately. It doesn’t seem to bother me, but I love driving. So true!!!! my gosh, have already done 2 road trips in Italy (Sicily and Sardinia) and in both, it was chaotic!! your tips are really helpful! keep on traveling, enjoying and reporting!! Keep up with the adventures! Subscribe to get new posts via email.